BIOS (Basic Input Output System) යනු කුමක්ද? සරල සිංහලෙන් කිවොත් BIOS කියන්නේ Firmware එකක්. මේක තියෙන්නේ Motherboard එකේ තියන පොඩි චිප් එකක් ඇතුලේ. Operating System එක Load වෙන්ඩ අවශ්‍ය Instructions ඔක්කොම දෙන්නේ මෙන්න මේ BIOS වලින්. ඔයාගේ Operating System එක load වෙන් නැත්තං BIOS හරියට Instructions දීල නැ. පරිගණකය On කරපු ගමන් BIOS මගින් Instructions දෙන්ඩ පටන් ගන්නවා. මෙම Instructions කීපයක් පහල තියනවා. පසුව පරිගණකයට නොවැදගත් දේත් check වී පසුව Keyboard හා Mouse check කර Boot Device Options වෙත යාම. ඊළගට පිළිවෙලට Boot Device Options check වීම. උදා. Boot from CD-ROM, Boot From Hard Drive, Boot from LAN etc. ඔය තියෙන්නේ BIOS වලින් වෙන දේවල් වලින් පොඩ්ඩක්. තව CMOS & එකෙක Chips එහෙමත් check වෙනවා දිනය හා වෙලාව එහෙම සෙට් කරගන්න හා Device Drivers load කරගන්න. අපි දෙන input එක check කරලා RAM එකට යවන්නෙත් BIOS. උදාහරණයක් ගත්තොත්, අපි මොකක් හරි key එකක් එබුවොත් එක කෙලින්ම BIOS වලට ගිහින් එතනින් එක කෙලින්ම Operating System එකට යවනවා. ඊට පස්සේ key එක ප්‍රෝග්‍රෑම් වෙලා තියන විදිහට Operating System එක තීරණය කරනවා දැන් මොකද්ද වෙන්ඩ ඕනේ කියල. Operating System එකට BIOS නැතුව වැඩ කරන්ඩ බැරි ඇයි කියල ඇහුවොත් එකට ප්‍රදානම හේතුව තමා Hard Disk & Removable Disks වල Device Drivers තියෙන්නේ BIOS වල. BIOS Hard Disk & Removable Disks වල Drivers load කරලා දුන්නට පස්සේ ඔන්න Hard Disk එක වැඩ කරන්ඩ පටන් ගන්නවා. ඊළගට OS එකේ පර්දනම කොටස් වෙන MBR, GPT, FAT RAM එකට load උනාට පස්සේ Operating System එකට ගානට වැඩේ කරගෙන යන්න පුළුවන්. 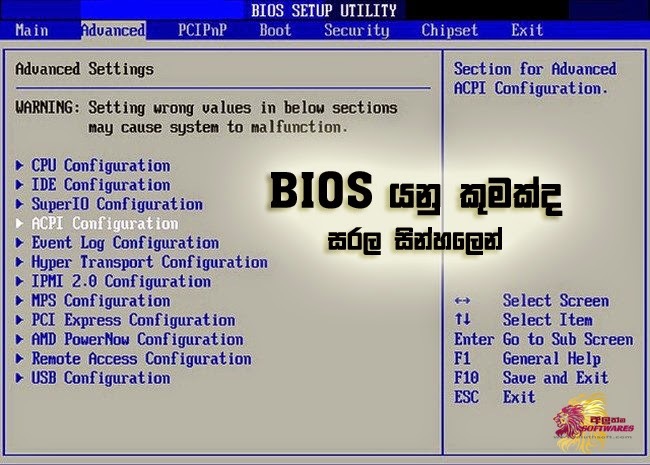 BIOS Settings වෙනස් කිරීම ඉතාම පහසු කාර්යක්. 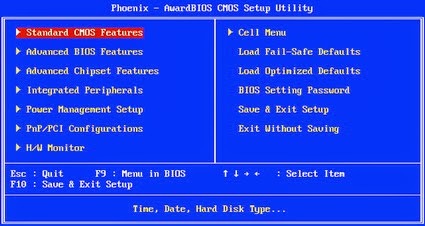 අපි 90% කම BIOS Settings වලට යන්නේ Boot Order එක වෙනස් කරන්න. ඒ ඉතින් machine එක format කරගන්න. එක ඉතින් ගොඩක් දෙනා දන්නවනේ. BIOS Settings වලට යන්ඩ විශේෂ key එකක් තියනවා. එක මොකද්ද කියල හරියටම කියන්න බැ මොකද පරිගණකයෙන් පරිගණකයට එක වෙනස් වෙනවා. ගොඩක් වෙලාවට එක Delete හෝ F2 වෙන්න පුළුවන්. පරිගණකය on කල විගසම Moniter එකේ Brand name එක පෙනෙද්දී එතනම යට ඇති මේ key එක මොකද්ද කියල. Brand name එක වැටුන ගමන් මේ key එක press කරොත් අපිට කෙලින්ම BIOS Settings වලට යන්න පුළුවන්. එවිට බොහෝ විට පහත ආකාරයේ අකුරු ටිකක් පෙනේවි. මෙයද පරිගණකයෙන් පරිගණකයට එක වෙනස් වෙනවා. පරිගණක තාක්ෂනයදියුණු වෙන්ඩ වෙන්ඩ අලුත් උපාංග නිපද වෙනවා. මේ ඔක්කොම පරිගණකය සමග ක්රියාකරන්ඩ නං අනිවම BIOS Update කරන්න වෙනවා. අලුත් උපාංගයක් Drivers දැම්මත් හරියට වැඩ නැත්තන් ඒ කියන්නේ BIOS Update කරපුහම එක වැඩ කරන්නත් ඉඩ තියනවා. එහෙම සීන් එකක් උනොත් BIOS update කරලා බලන්න. අත්දැකීමෙන් කියන්නේ. තියනව නං එක download කරලා එක run කරන්න. අපේ ලේසියට දැන් BIOS Update එක setup එකක් විදිහට එන්නේ. දැන් Bios Chip එක සම්පුර්නෙන් Erase වෙලා update වෙනවා. Current එහෙම හොදට තියේ කියල හිතෙන time එකක තමා මේක කරන්න ඕනේ.මේක බාගෙට වෙන ගමන් Current ගියොත් ඔක්කොම Currupt වෙනවා. සැහෙන්ඩ බොන්ඩ වෙනවා ඊට පස්සේ.